Everything about the Huffy Panama Jack ® Bicycle is about feeling laid back and worry free. That’s how you’ll feel when you sit on this cruiser’s comfortable wide padded saddle. 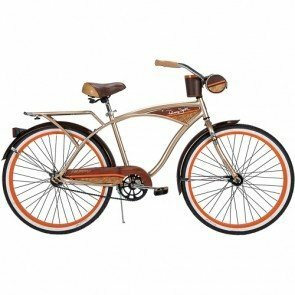 A classic steel cantilever frame holds it all together, while alloy rims, whitewall tires, and painted steel fenders give the Huffy Panama Jack® Cruiser a cool look that you’ll want to take with you everywhere. The Panama Jack® cruisers from Huffy combine a great look and loads of details for vacation-like fun every time you ride.